With the line in place, I tie one end to the center insulator of my antenna. I like to then connect the coax to the insulator and temporarily raise it all up to about eye level. This makes it easier to unbundle and route the two green wires vs. doing it on the ground where it will get caught in just about everything that can catch an antenna wire... which is everything. 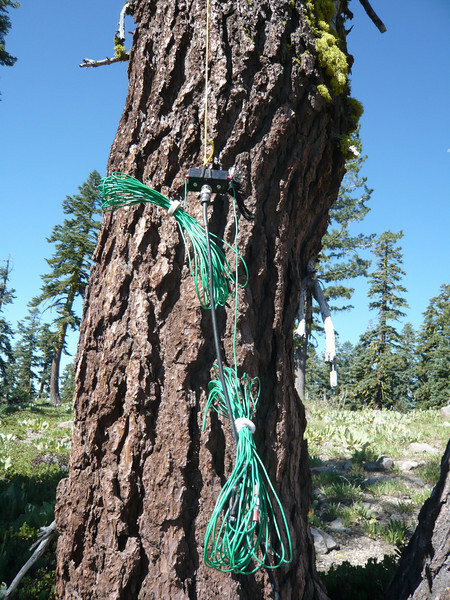 I then pull the center insulator up to just under the branch and tie off the line to whatever is available.